One thing I am beyond obsessed with is smells. Mike jokes that I can smell the food on tv – I have such a strong sense of smell. I want my house, my office, and my car to always smell fantastic. That is why I have been such a huge fan of Pink Zebra – a direct sales company with some of the most delicious smelling products you have ever sniffed! The products that Independent Pink Zebra Consultant Lori Sharkey sent in were no exception, and I have fallen in love with a new scent! 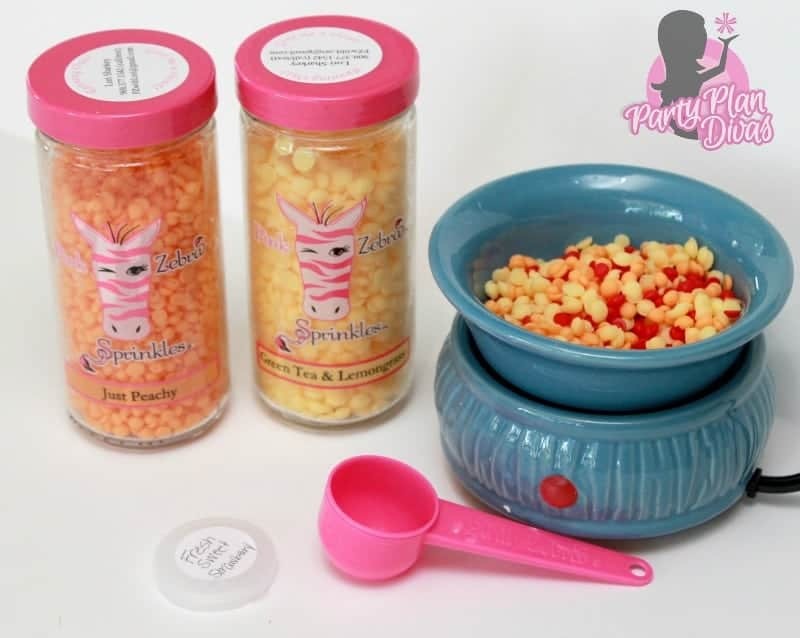 Besides the amazing scents from Pink Zebra, what also sets them apart from other companies is their “Sprinkles” – tiny little soy wax bits that hold a ton of fragrance. 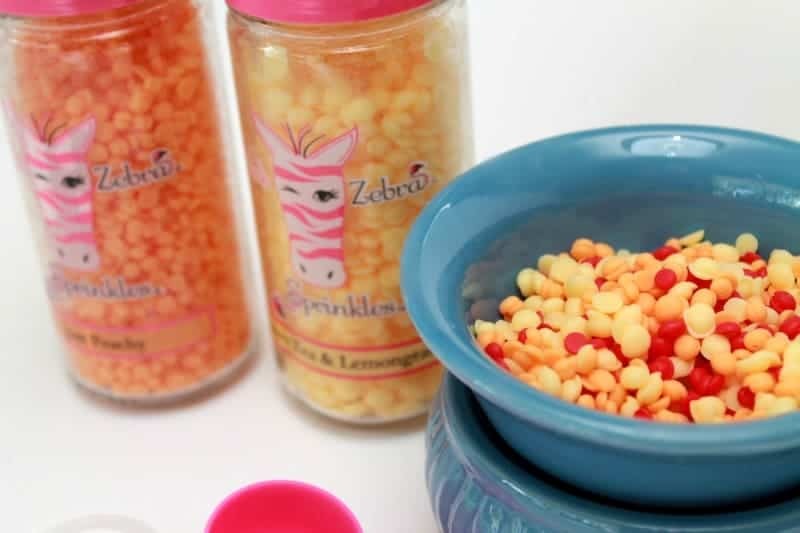 The Pink Zebra Sprinkles pour out of their canisters easily and you can use as little or as much as you want to reach your desired scent strength. Even better, you can concoct “scent cocktails” by mixing Sprinkles together which is what I did here. Lori sent me a beautiful blue Pink Zebra Simmering Pot – which melts the Sprinkles at the perfect temperature for the most fragrance – and a jar of Just Peachy and Green Tea & Lemongrass Sprinkles. She also sent in a scoop of Fresh Sweet Strawberry Sprinkles – so I mixed them in there too! Within minutes my room was filled with a delicious crisp scent of Summer. It was absolutely divine. Pink Zebra offers and impressive line of products to scent your space. From their signature Sprinkles to Reed Diffusers to their new Soaks, Pink Zebra has some of the most delicious, unique scents you simply can not find anywhere else. As a Pink Zebra Hostess, you can earn great rewards and exclusive products for sharing the products with your family and friends. As a Consultant you can build a business with a unique product that works for every home. Check out Lori’s website to learn more about how you can get involved with Pink Zebra!